As the Obama administration’s decision regarding whether to approve the controversial Keystone XL pipeline draws nearer, the latest disaster is raising serious concerns about the safety of Canada’s rapidly expanding pipeline network. A massive toxic waste spill from an oil and gas operation in northern Alberta is being called one of the largest recent environmental disasters in North America. First reported on June 1, the Texas-based Apache Corp. didn’t reveal the size of the spill until June 12, which is said to cover more than 1,000 acres. Members of the Dene Tha First Nation tribe are outraged that it took several days before they were informed that 9.5 million liters of salt and heavy-metal-laced wastewater had leaked onto wetlands they use for hunting and trapping. “Every plant and tree died” in the area touched by the spill, said James Ahnassay, chief of the Dene Tha. The leak follows a pair of other major spills in the region, including 800,000 litres of an oil-water mixture from Pace Oil and Gas Ltd., and nearly 3.5 million litres of oil from a pipeline run by Plains Midstream Canada. 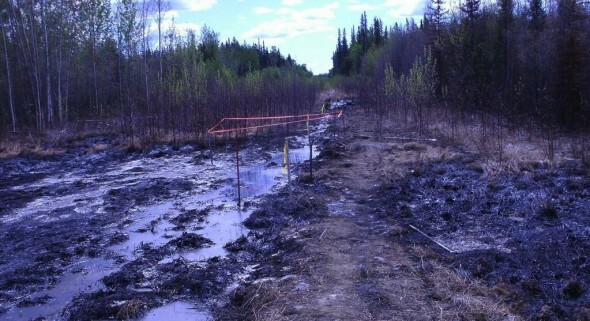 After those accidents, the Dene Tha had asked the Energy Resources Conservation Board, Alberta’s energy regulator, to require installation of pressure and volume monitors, as well as emergency shutoff devices, on aging oil and gas infrastructure. The Apache spill has renewed calls for change. Following initial speculation that the leak stemmed from aging infrastructure, officials from Apache Corp. revealed that the pipeline was only five years old and had been designed to last for 30. Site contents copyright © 2019 Recorder Online	except as noted. All rights reserved. | 96 queries in 2.496 seconds.